The Apogeeâ„¢ GTZ is Swiftech's new flagship water-block. While it shares the same name with its predecessors, it also leaps beyond the GT and GTX performance charts thanks to an entirely new design that pushes and refines both thermal and mechanical specifications to the limits of today's technology. Thermal design of the cooling engine combines the benefits of direct coolant impingement over the CPU area with an entirely new copper base plate design which is primarily characterized by a pin matrix composed of 225 Âµm (0.009") micro structures. This results in a 20% improvement in thermal resistance compared to the Apogeeâ„¢ GTX. 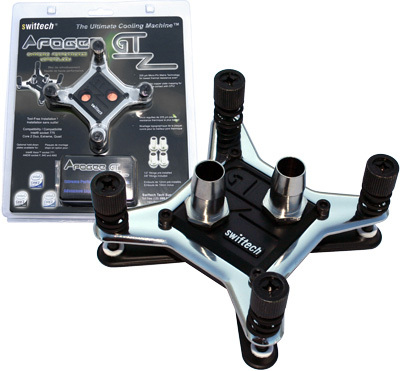 The Apogeeâ„¢ GTZ is shipped with an IntelÂ® Coreâ„¢ 2 (socket 775) compatible hold-down plate and complies with socket 775 keep-out specification, thus guaranteeing compatibility with all socket 775 type motherboards.